During a recent trip to Milan, Italy, while I was meditatively wandering around the vast and magnificent Gothic edifice, Duomo di Milano, I spied the light magic for which I’d been hoping. 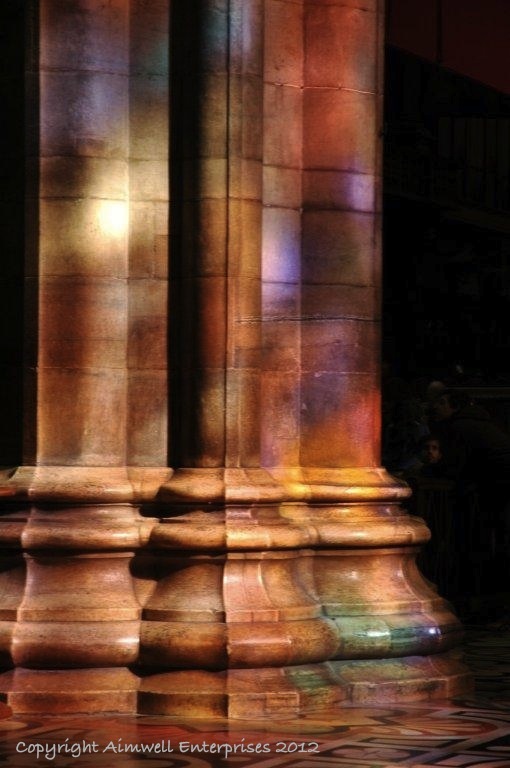 I lingered a moment and watched as shadow and light shimmered over and around the massive stone column and across the polished marble floor. It was mesmerizing. Between groups of tourists and without the use of flash I was able to capture this image. I know I talk about looking up, however sometimes everything you need to be inspired at a particular moment is standing right in front of you. This entry was posted in Inspiration, Musings, Photography, Reflections, Thoughts, Travel, Uncategorized and tagged Cathedral, inspiration, Light and shadow, Milan, Photography, Sacred spaces, stained glass, Travel. Bookmark the permalink.